Whether its with an adult coloring book or simply a freeform drawing, colored pencils are a great and accessible medium to expand your creativity without the need of a ton of supplies. All you need to get started is simply colored pencils, a good sharpener, and of course some drawing paper that works well with those colored pencils. But as we recently found out in our review of some of the best professional colored pencils – they can get quite expensive with some costing nearly $5 per pencil. Now if you are just looking to use colored pencils casually and you don’t really need or care about lightfastness ratings, pigment concentration, etc. then this guide will be for you. Today we are going to highlight some of the very best, yet incredibly cheap, colored pencils that still deliver vibrant results for only a fraction of the price. For the folks out there that like to see clear comparisons, we went ahead and put together this table for you where you can see how all the top brands compare with one another. Everyone knows Prismacolor – their name is synonymous with colored pencils. 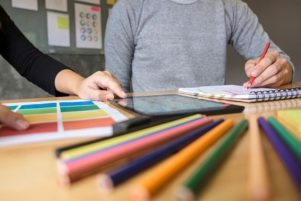 However, while many may recognize their black tin of colored pencils that might cost a fair chunk of change, the Prismacolor Scholar’s challenge this notion of a premium brand. In this 48-piece set, you have not only a wide spectrum of colors to work with, but in true Prismacolor fashion, the strokes on the paper will be intensely bright and vivid helping your freeform drawings or even coloring books spring to life. With a waxy smooth core, you can expect to get a fair amount of blending. Of course, if you really want to push these pencils, then we recommend checking out some of the few colored pencil techniques we recently wrote about. With over 2,000 reviews at major online retailers and nearly a perfect rating, its easy to see why they are so popular. When compared to others on our list, these do cost slightly below the average at $0.31 per pencil – a steal given the quality. 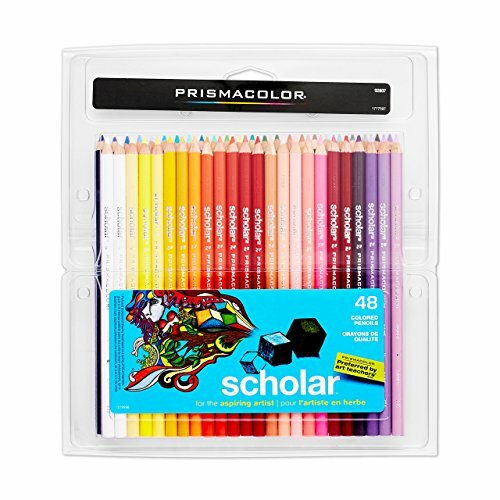 Overall, if you want to go with a trusted brand, then the Prismacolor Scholar’s make an excellent choice. Castle Art Supplies is the go to company when it comes to affordable supplies (as we recently discovered when reviewing their cheap acrylic paint). They carry this same mentality to their colored pencil set as well. In this massive 72-piece set, you have just about any color that you could possibly want that will deliver vibrant results. So if you want to employ the “Rule of 3s” where you select a family of 3 closely related monochromatic colors – you can. This results in more natural shading with colored pencils that can really add both depth and dimensions to your finished pieces. What we also loved about these pencils is that they carried many characteristics found in pro brands – such as a matte barrel that is perfect for better grip and control along with a number on the top of every pencil. Therefore, if you are drawing outside of the studio and want to note which colors you were using, you can simply write them down and continue where you left off without the fear of mixing up colors accidentally. Perhaps the biggest selling point to this is the compact design. So, if you only use your colored pencils on occasion, you don’t have to worry about them taking up too much space in your studio or art cabinet. Overall, if you want a quality brand that provides a velvety texture that can lay down smooth strokes – go with these. It’s one of the largest yet most affordable colored pencil set on our list. 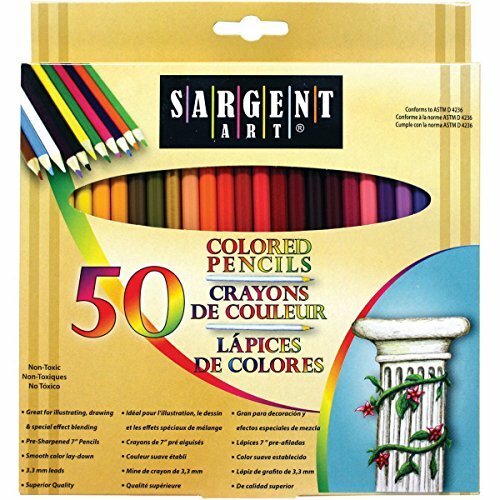 We absolutely loved this colored pencil set by Sargent Art when it came to both affordability and selection. With sets available in 12, 24, 36, 50, and 52 sizes – you can find the perfect one to fit your needs (helping to ensure that you don’t waste any money buying pencils you don’t really plan on using). But what really sweetens this deal from Sargent Art was the cost per pencil. When doing the math on their 24 pack, we saw that they only charge $0.21 per pencil – that’s cheap. If you are thinking about the 50 pack (which only costs a hair under $6.50), the price per pencil is only $0.13 – making it the most affordable on our list. So, with such a cheap price, does this mean that the pencils won’t perform well? Sure, they might not be as bright as the Blick Artist Grade Colored Pencils nor as smooth as the Prismacolor Scholars, but they are acceptable. Based on artist feedback, we found that these are going to be best suited for either kids or young teens as they are best intended for initial exposure to this medium. Overall, you can’t deny the affordability of the Sargent Colored pencils. It’s the best deal you can find for the quality and performance delivered. Book publisher Peter Pauper Press has made countless adult coloring books including Tropical Paradise, Doodle Designs, and many more. So, it would only make sense if they sold colored pencils to go along with their impressive coloring book lineup! 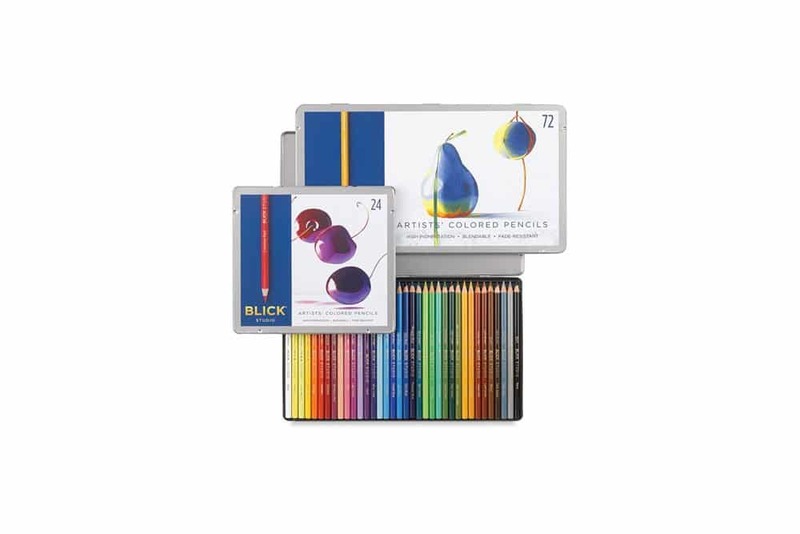 As such, their Studio Series Colored Pencil set is one of the most comprehensive on our list. In this set of 30 (the only set size they currently make), expect to pay about $0.25 per pencil (nearly rivaling the cost for Sargent and Artlicisous Colored Pencils) making these incredibly affordable. 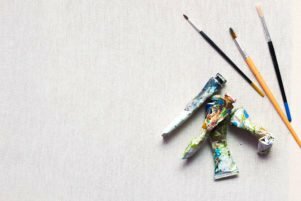 These additions not only save you a fair bit of money on your art supply bill but will be more than enough to get you started. While some artists claimed that this eraser isn’t nearly as good when compared to a top-rated erasable colored pencil, it still should be more than enough to remove about 90% of the marks on the paper (which can be covered up easily with another color). Extras aside, artists were pretty happy with the performance of these colored pencils. They were able to blend and shade rather well, and the colors were fairly vibrant. Overall, this is a perfect set for a beginner. The added eraser and sharpener are great to have on hand and further reduce the overall cost for this set. 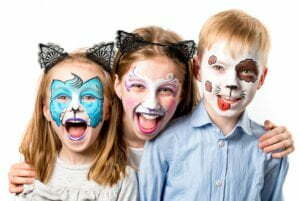 They deliver some of the most cost-conscious art products on the market today. As we often exclaim here on the site, its not the price of the supplies that matter, but rather the talent that is holding the pencil (i.e. you). And this same thought process of thrifty, yet smart purchases, is why we also wanted to include the Artlicious Colored Pencils to our list today. With pencils only costing $0.20 a piece, this 50-piece set is a highly affordable and well performing. 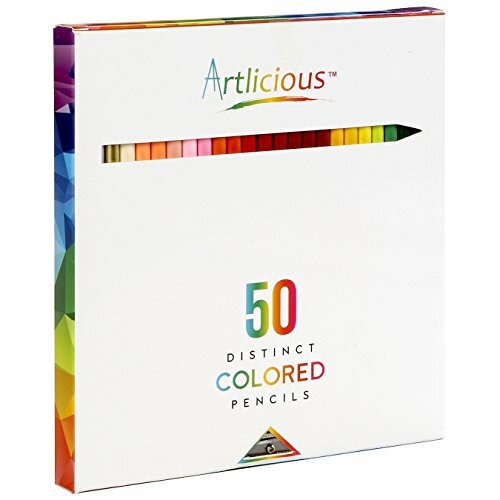 Like the Studio Series colored pencil set, the Artlicious set also throws in a colored pencil sharpener to help further reduce the costs. Conforming to ASTM D4236 (standard practice for labeling art materials) and containing only non-toxic ingredients, this colored pencil set is perfect for children. While the vast color spectrum is great for variety and vibrance in every color, the equally soft leads will resist breakage even when used with an electric sharpener for colored pencils. If there were any large complaints/feedback we saw that fellow artists had with this set it would be around the lead core diameter. At only 3.3mm, it is rather small compared to most – so wide strokes will be a bit tougher – although your fine detail work will be much better. Overall, these non-toxic colored pencils are perfect for kids. The wide color variety ensures vividness that will make the artwork truly spring to life. 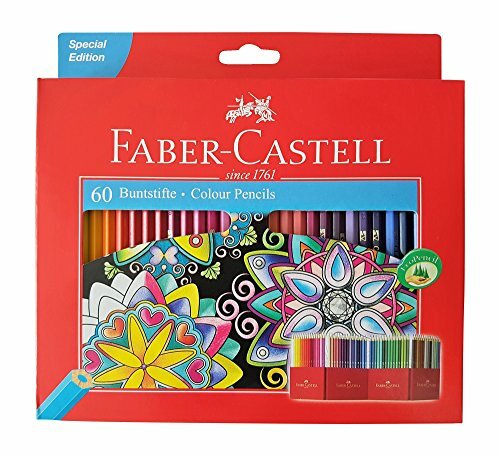 Faber-Castell makes a variety of colored pencils intended for serious applications. As we discovered with their oil-based Polychromos line in our recent review, they know how to make a quality product. While certainly not the cheapest at $0.46 per pencil, nor the most expensive, these colored pencils are great for those adults who don’t necessarily want to use a “kids’ pencil” and want something that they could grow into. Whether you want more intensely vibrant colors or those that will feel much more smooth when going on the surface – these are a great alternative to the Blick Studio Artists’ and Prismacolor Scholar colored pencils. While Faber-Castell has been around since 1761, their production methods have smartly evolved over the years. Each one of the pencils in this set is made from 100% FSC certified reforested wood – lessening their impact on the environment when they are made. Overall, these are a step up from the bargain brands and perform like a pro brand. The sustainable production process is welcomed. 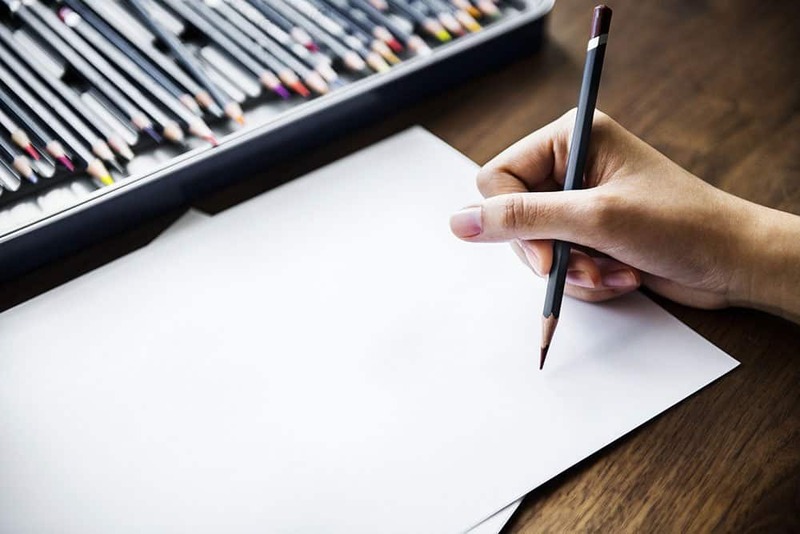 Prang is one of those art supply companies that have been around for years by catering to a market that is on a tight budget. 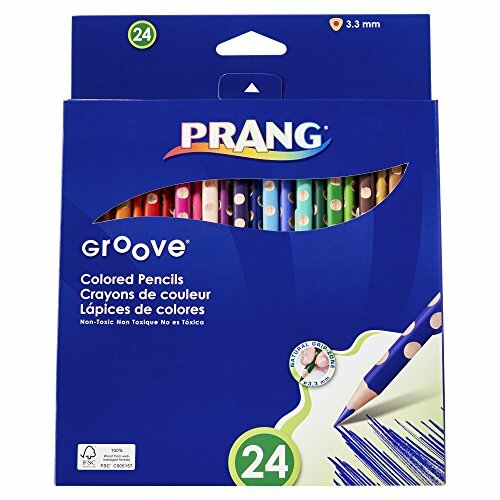 Perfect for both elementary and young adult applications, the Prang Groove Triangular Colored Pencils are a great intro into this fun medium. While not expansive as a set like the Artlicious Colored Pencils, nor as cheap as the Sargent Art Premium Colored Pencils, Prang’s rest somewhere in the middle. With a unique and ergonomic triangular barrel, it will make it much easier for kids to have a greater level of control when making marks or filling in the colors of their favorite coloring books. Like the Artlicious colored pencils, these Prang pencils do have a smaller than average lead core at 3.3mm. While this can be great for fine detail work, when it comes to large color blocks on the paper, it will take a little bit more effort and patience to fill in. Lastly, while the triangular wood barrel may seem like a huge limitation when it comes to sharpening by requiring you to use a pocket knife or sanding block, a standard pencil sharpener should do the job – especially given how rigid these pencils are. Overall, these are an affordable pencil that is great for casual use. The triangular barrel design will be loved by kids due to its uniqueness. Expect to apply a little bit more pressure than normal to create bright marks on the paper. Found in popular craft stores like Michael’s & Hobby Lobby, Reeves is an affordable brand that delivers quality results. 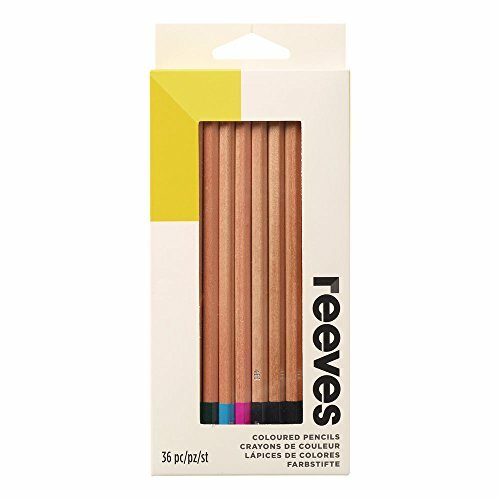 While we love their minimalist packaging and design aesthetics, these Reeves Colored Pencils are silky smooth like some of the other higher end brands mentioned thus far on our list. Not only is the lead core smooth, but when doing shades or blends, they do play rather well together – especially when used on the Canson XL Mixed Media pad. Available in sets of 12, 24, or 36, you can find the perfect one for you without wasting any excess money. 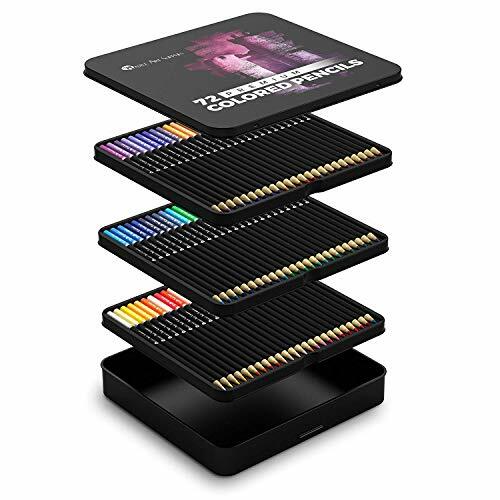 Given that these just generally look nice, if you are looking for a gift, these or the Studio Series Colored pencil set would make a perfect gift as they present well. If there were any large complaints that artists had around this brand, it would be with the color selection (and we would agree with them). At only 36 colors total, you will have to rely on a bit blending in order to get colors that aren’t included. Overall, we think these are great for both gifts and coloring books. Their limited color selection is a bit tough, but past that it’s a decent pencil. For those who want a cheap, yet professional grade colored pencil, then one of the best picks on the market will be these pencils from Blick. Maker of all things quality, yet affordable, Blick colored pencils are no exception to the rule. Available in 12, 24, 36, 48, and 72 set sizes, you can find the perfect sized option for you. Unlike many of the other colored pencils on our list, these ones by Blick can be purchased separately – making it perfect should you be working on a much larger scale drawing and need to restock without having to repurchase an entire set. Each of the barrels are made from a cedar casing that provides both comfort and performance. In addition, the 3.8mm lead core is great for a variety of stroke widths. For those who want to see color chart and swatch info, Blick does provide this here for all 91 colors. Given that these are a cheap professional grade colored pencil, when compared to some of the more elementary options on this list, they are one of the more expensive offerings. Expect to pay roughly $0.73 per pencil ($0.95 if purchased individually). 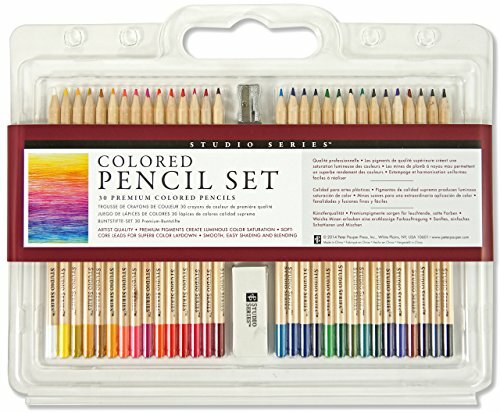 Overall, for the quality received these are the best colored pencils for those intermediate or professional level artists on a tight budget. The colors are vivid and their performance is one of the best. Finding the best cheap colored pencils in 2019 was pretty tough. With so many brands in this crowded marketplace, its hard to cut through all the marketing fluff and find out what performs the best given a limited budget. However, after looking at many brands and narrowing our list down to a select few, we are confident that we found the best that currently exist in the market today…and we think you will too! Naturally given that we are a bit smaller of a site, we don’t have nearly as much resources to dedicate when compared to larger media companies. So, if you feel like we completely missed a brand, please let us know – we would love to consider adding them. We hope that this guide proved helpful in building your artistic career!